Sticky elements are predominantly used for keeping something shown on the screen throughout scrolling. As cool as that is, we can also hide elements in the same way! See the Pen position:sticky (CSS) by Preethi Sam (@rpsthecoder) on CodePen. See the Pen position:sticky (CSS) by CSS-Tricks (@css-tricks) on CodePen. Well, guess what? We can do that with sticky elements! See the Pen Slide In and Out Effect using "position:sticky" by Preethi Sam (@rpsthecoder) on CodePen. How do we do that? Glad you asked. Let’s break it down. The first one is the category header that slides under the body of the article once it reaches the top of the screen. The second is the title of the article and it stays visible at the top of the screen, while the body of the content disappears behind it on scroll (which is the typical sticky element behavior). The third element is a footer that slides out of the article and is revealed when the article is scrolled above a certain threshold. The .category, .title, and .footer elements will get position:sticky; along with a placement property saying where on the screen they’ll start "sticking" when scrolled. I’m not doing much to the sticky elements, except styling them. They’re already doing what they need to do: stick to the screen. All that’s left is to create a cover and some space for the elements to come in and leave as the page scrolls. There are probably a bunch of ways we can create a cover on the article that sticky elements can pass and hide under on a page — I went with a background-image. The background linear gradient is applied to the article and runs from top to bottom, starting with 50px of transparency and a color change with a hard stop at 50px. The calc stuff? That’s how I’m telling the color to continue but leave 50px at the bottom. Then we go transparent again. That means we have two 50px transparent stripes, one at the top and one at the bottom with equal heights matching the heights of the category heading and the footer. The category header and the article footer are the elements that slide in and out of the text, so their heights are the ones that determine how long the transparent stripes will be at the top and bottom of the gradient. How this all comes together is that both the category header and article title stick to the screen when their tops align with the top of the viewport. The title stacks on top of the category header and, when it starts sticking at the top of the viewport, hides the category header altogether. As for the footer, it’s already stuck 100px above the bottom of the screen (within the article’s boundary), but you won’t see it since it’s pushed behind the content using z-index:-1. It’ll be visible once we scroll past the beginning of the last transparent stripe of article’s background. Because the category header is just content with nothing to conceal with but the text itself, it’s a good idea to give the last sticky element (the footer) a top margin of 50px (to keep things equal) so that you won’t see it behind the category header while scrolling. Now, of course, you’ll want to make this your own and change it up, like the dimensions, number of elements, and type of content. The key is to create those covers that allow your sticky elements to hide behind and be revealed as they pass through — again, probably different ways to go about that, but I went with transparent stripes in a gradient. See the Pen Horizontal slide in and out effect using sticky elements by Preethi Sam (@rpsthecoder) on CodePen. See how the food gets revealed as one article leaves the viewport and then is hidden when the next article passes over it? 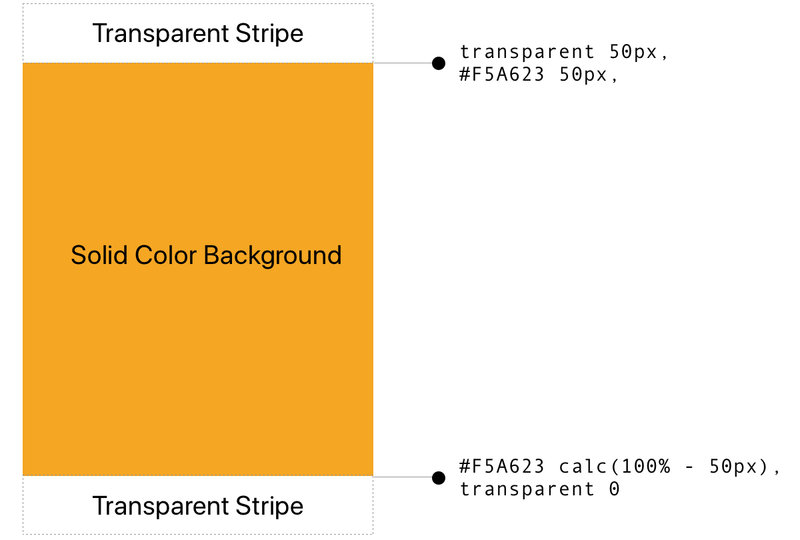 Notice again that we’re going with the same two 50px transparent stripes as before — the only difference being that we’re applying it to the width instead of the height. Both of the sticky elements (the title and image) will slide under and through the article. So, in order to avoid overlapping them during scroll, the title gets a right margin that’s equal to the image’s width, which is 50px (plus an additional 2px for a cleaner line in Chrome). Here’s what’s going on: as we scroll horizontally, the title sticks 20px from the screen’s left edge and the image sticks 150px from the same. Because they both have z-index: -1;, they’ll disappear under the article (well, the background gradient) — they are hidden as they pass through the solid color of the gradient and are revealed by the transparent stripes. Before wrapping up, let me show you one more example that inspired this post. It’s a site footer that reveals itself on scroll. I first saw this design at Ryan Seddon’s website a long time ago. This design is usually done by using a "fixed" footer that’s given some space at the end of the page to come out to, using margin. I thought if fixed elements can do that for the whole page, then maybe sticky elements can do something similar for individual elements — and hence what I came up with so far. Consequently, we can accomplish this same effect using the sticky techniques we’ve covered so far. See the Pen Page footer slide-out using "position:sticky" by Preethi Sam (@rpsthecoder) on CodePen. A sticky footer and background gradient on the body does the trick. Since this effect requires the revealed element the be stacked beneath with negative z-index, it renders the element inaccessible to pointer events. Not necessarily a significant issue for something like a graphic/ornament but if I’m understanding correctly, that element could not contain an interactive element such as a link/button. Do you have an implementation that would allow interaction? It would be really cool to say reveal a toolbar of options. Apply a z-index of 0 or more and position: relative to the parent container. Done! Hi James – Now I’ve got that element which was previously being revealed rendering on top of the section body which defeats the whole point. Have I misunderstood something?